Wolfenstein: The New Order was one of the biggest surprises of 2014. Leading up to its release, few people expected the title to be as fun and frantic as it was. The combat and character storylines were just a few tidbits that made The New Order successful. With the games success, many were curious what would come of the now revitalized series. Just one year later, developer MachineGames has decided to bypass producing The New Order-exclusive downloadable content and, instead, create a standalone prequel entitled Wolfenstein: The Old Blood. Wolfenstein: The Old Blood begins with you taking over the reigns of BJ Blazkowicz, the protagonist who has become associated with all Wolfenstein games. This go around, your adventure takes place in the year 1946. At the beginning, you and a fellow soldier/spy by the name of Wesley decide to infiltrate Castle Wolfenstein. As you might expect, things quickly go awry as Wesley gets himself captured. From there, BJ finds himself fighting through the Nazi horde by his lonesome in hopes of finding his partner. Wolfenstein: The Old Blood is split up into two separate acts, with the first taking place in Castle Wolfenstein and the next taking place in a small town and its surrounding areas. The narrative elements are never quite as interesting as you want them to be, as there is only so much interest you can drum up over “BJ has to find a folder.” The first act can produce some fun moments, mostly due to its setting, but the second act feels forced and disjointed. On top of that, the second act concludes in a supremely underwhelming boss fight. When you think of first person shooters, the characters found within them are typically not the first things that come to mind. That was not the case in Wolfenstein: The New Order as the game managed to give a fully formed character to the heroic archetype that surrounded BJ Blazkowicz. Apart from him, the game was filled with characters that formed an emotional connection that was not expected, from the love interest all the way to Jimi Hendrix’s memorable role. That character development is nowhere to be seen within Wolfenstein: The Old Blood. You head from chapter to chapter, with no real background being formed around your partners or enemies. There are sections within the game where a character close to BJ dies, and it feels as if the player is supposed to have some sort of attachment. But there have been no attempts of establishing that attachment, as the character has only uttered two lines of forgettable dialogue up to this point. It feels as if MachineGames wanted to evoke the ultimate emotional payoff, but not do the hard work of building the characters. This negative is easily the most disappointing aspect of Wolfenstein: The Old Blood. The beginning gameplay sections of Wolfenstein: The Old Blood are incredibly off-putting. You gain ownership of a pipe, something that will be vital to your time with The Old Blood, and are then propelled into frustrating stealth encounters. Due to not having a ranged weapon, you have no choice but to sneak around as large robots slowly prowl about, just waiting to blow you away with their Gatling guns. You kill these robots by sneaking around and disrupting some of the technology that brings them to life. Doing so requires you to sit for at least five to ten seconds in the open as your character holds down a lever, which is quite difficult when oversized robots are roaming around. Ultimately, you find yourself having to memorize paths of your enemies in order to accomplish anything. Thankfully, this forced stealth ends after an hour, but it still leaves a foul beginning taste in your mouth as a first impression. After this initial hour, the combat becomes exactly what you enjoyed in the previous Wolfenstein installment, only with new weapons. 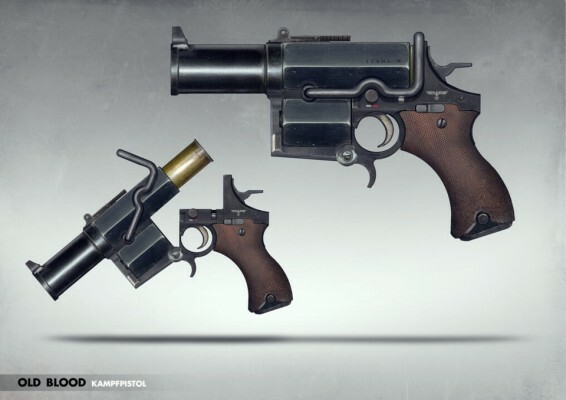 You get around five or so new weapons, but one of the best is the Kampfpistole, a pistol sized weapon that shoots out a rocket. Unfortunately, you do not receive a ton of ammunition for this gun throughout the game. Despite that, it is hard not to have a large smile on your face every time you pull the trigger on it. You also get to use the schockhammer, which is a predecessor to the shotgun used in New Order, although it seems to have a better range in The Old Blood. Of course, you can still dual wield two machine guns (or two schockhammers) and just unload on every Nazi in your sights. Doing so is still a blast and will have you quickly remembering why Wolfenstein: The New Order was so damn fun. Unfortunately, that feeling of similarity to The New Order persists throughout a majority of The Old Blood. It never feels like anything too different from its previous iteration. While the combat continues to be solid, it is not enough to hold up yet another game that approaches 6-7 hours in length. There is a new gameplay concept introduced in the final third of Wolfenstein: The Old Blood that attempts to diversify things, but it falls very flat. Without spoiling the actual reveal, it is a tired concept that has been shoehorned into many games after-the-fact in hopes that it would freshen things up. While it has succeeded for other games, it does not do so in Wolfenstein and only strips away the best thing in The Old Blood –the gunplay. While the gameplay concepts introduced in the second half of The Old Blood fall flat, at least the visuals in that second half are enjoyable. The bright art acts as a nice change of pace from the dark, concrete corridors you find yourself in throughout the first half of the game. That being said, the paintings you run into within Castle Wolfenstein can provide quite the chuckle due to their absurdity. Wolfenstein: The New Order established a new life into the Wolfenstein series. While that life has not been squashed with The Old Blood's release, it has taken a slight hit. Many of the key aspects that made The New Order so enjoyable have not been carried over into The Old Blood. Of course, the enjoyable combat is still available to all, and is still a blast to partake in with the new weapons being absolutely brilliant additions. But, in the end, you cannot help but think, "this could and should have been so much more."